British Transport Police - tel: 0800 405040 or text 61016 to report a crime or incident. Cross Country - cheap train tickets for any train journey in Great Britain with no booking fee, special offers, timetables and more. Grand Central - West Riding service connects Bradford, Halifax, Huddersfield (via Brighouse), Wakefield Kirkgate and Pontefract with London Kings Cross. Metro - co-ordinates public transport in our region. The website has journey planners for all types of public transport and provides information on train and bus timetables, tickets and passes. National Express - operates the East Coast line running from Edinburgh to London Kings Cross via York, Harrogate and Leeds, plus an integrated network of scheduled coach services. The website has train and coach journey planners. National Rail Enquiries - the definitive source of information for all passenger rail services on the National Rail network in England, Wales and Scotland. The NRE website offers journey planning, timetable and fares information and provides a range of rail-related information to rail passengers and is classified by the Government as a super-site. Particularly impressive is the plan of the station itself, which is the next best thing to a video and includes photos of all the station facilities so you can find your way around. Network Rail - operates the rail infrastructure, including stations. The website contains a train journey planner, information on timetables, tickets, etc, and useful information on station facilities. Northern - operates train services in the north of England and has a train journey planner, plus information on timetables, tickets and special offers. The Trainline - leading independent retailer of train tickets online, selling tickets for all train companies on all national routes. Trans Pennine Express - runs inter-city train services linking Liverpool and Manchester with Leeds, York and the North East, with Sheffield and Doncaster, and with the Lake District and beyond. Virgin Trains - provides passenger train services on the West Coast Main Line, serving major towns and cities including London, Birmingham, Manchester, Liverpool and Glasgow. Association of Community Rail Partnerships (ACoRP) - federation of community rail partnerships and rail promotion groups working towards a better local rail service and improved station facilities. Association of Train Operating Companies (ATOC) - represents rail passenger transport policy issues to the government, regulatory bodies and the media. Passenger Focus - independent public body which protects the interests of rail passengers and secures journey improvements. Railfuture - independent organisation working for a better passenger and freight rail network, including campaigning to get stations and lines reopened. Friends of DalesRail - a walking organisation which runs guided weekend walks ranging from 7 to 18 miles. Most walks use railways in the Yorkshire Pennines, mainly the Settle-Carlisle line. Friends of Littleborough Station - aiming to maintain and improve the heritage of Littleborough Station. 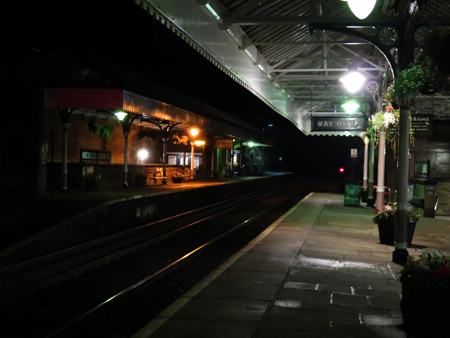 Mytholmroyd Station Partnership - blog from our "next door neighbour", giving information about meetings and changes to the train service. Friends of Sowerby Bridge Station - aim to breathe new life into Sowerby Bridge station for the benefit of all station users and attract more visitors (and custom) to the town. Todmorden Station Partnership - a lively and artistic group, whose website contains information about local railway history and lots of great photos. DalesRail - community railway operating on Sundays across Lancashire from Blackpool, and joining the Settle–Carlisle line. An extensive programme of guided walks from Settle to Carlisle stations provides a great opportunity to see the best of the Dales and Eden Valley countryside. Disused Stations - The purpose of the site is to build up a comprehensive database of this part of Britain’s railway heritage. Since the site was started it has developed to include goods stations, stations that have reopened and other railway related features. East Lancashire Railway - community railway running between Heywood and Rawtenstall, with intermediate stations at Bury and Ramsbottom, hosting special events throughout the summer. Embsay & Bolton Abbey Steam Railway - steam railway journey through the Yorkshire Dales between Embsay and the new station at Bolton Abbey. Film Archive of Railway Signalling & People (FARSAP) - The Society maintains and shares knowledge of Railway Signalling and Operation in the British Isles and Overseas. Everything from the present day signalling to the earliest times. Ingrow Railway Centre - home of the Museum of Rail Travel, and the Ingrow Loco Museum, based alongside the Keighley & Worth Valley Railway. Keighley & Worth Valley Railway - steam train services through the heart of Brontë country, as seen in the Railway Children. Lancashire & Yorkshire Railway Society - aims to bring together all those with an interest in the LYR whether it be in historical research or modelling. It also holds and maintains large collections of photographs and drawings. Lancashire & Yorkshire Railway Trust - the Trust owns a unique collection of steam locomotives and carriages previously owned by the Lancashire & Yorkshire Railway which it restores and preserves. Lost Railways of West Yorkshire - a collection of maps and photographs exploring the routes and history of the lost, abandoned, disused and dismantled railways of West Yorkshire: Leeds, Bradford, Huddersfield, Dewsbury, Batley, Halifax, Wakefield, Queensbury and Shipley, including the Aire, Calder and Spen Valley lines. Middleton Railway - the world's oldest continuously working railway, operating steam and diesel passenger services at weekends and on public holidays over approximately 1 mile of track between Moor Road Station, Hunslet, Leeds and Park Halt on the outskirts of Middleton Park. There is a programme of special events throughout the year. National Railway Museum - over 300 years of railway history can be seen and explored in this York museum, where entry is free for all except for certain special events, when charges are made. North Yorkshire Moors Railway - an 18-mile railway running across the North York Moors from Pickering via Levisham, Newton Dale, Goathland, Grosmont and Whitby. Trains are mostly steam-hauled but heritage diesel is used. As well as the normal passenger running, there are dining services on some evenings and weekends. Excellent programme of special events throughout the year. Wensleydale Railway - community railway running between Leeming Bar and Redmire (on the edge of the Yorkshire Dales National Park), via Bedale and Leyburn. This is the first part of a project to restore the full 40 mile route between Northallerton (on the East Coast Main Line) and Garsdale (on the Settle-Carlisle Railway). Hebden Bridge Community Association - a community-run charity which has taken over the control and management of Hebden Bridge Town Hall and runs it for the benefit of the community. Meeting rooms can be booked and the Association is seeking major capital funding to create new-build enterprise and community facilities. Hebden Bridge - a website run by the Hebden Bridge Business Forum to promote the town. Hebden Bridge Local History Society - formed in 1949, the Society has an extensive local history archive and organises summer walks and local courses. Pennine Horizons Digital Archive - An amazing collection of images gathered over a number of years covering the Calder and her valleys. The David Taylor Collection has many interesting railway photos. Hebden Bridge Web (Hebweb) - Hebden Bridge's community website, with local news, forthcoming events, photographs, and a discussion forum on local issues. Hebden Bridge 500 - Hebden Bridge’s packhorse bridge was 500 years old in 2010. Around 30 different groups pooled their efforts in a programme of events – ranging from music performances to costumed re-enactments, from exhibitions to food and film festivals – in a shared celebration called HB500. Incredible Edible Todmorden - Incredible Edible Todmorden aims to increase the amount of local food grown and eaten in Todmorden. Public flower beds are being transformed into community herb gardens and vegetable patches! Mytholmroyd Net - news, photographs, and a discussion board for the village of Mytholmroyd. Pennine Heritage - environmental trust dedicated to maintaining the unique heritage of the South Pennines between the Peak District and the Yorkshire Dales national Parks. Rochdale Canal - This site, although no longer updated, has well-researched history about the Rochdale Canal. Tod Talk - Todmorden's community website, with local news and issues, photographs and a discussion group. Firstbus operates the services from Halifax via Hebden Bridge and Todmorden to Burnley or Rochdale. TLC Travel operates the smaller local buses to the hilltop villages, the larger housing estates and also a service via Cragg Vale to Huddersfield. Keighley Bus Company operates the Bronte Bus service 500 to Keighley via Haworth. Metro - as under 'Rail travel' above. National Express - as under 'Rail travel' above. Yorkshire Heritage Bus Company Ltd - classic vintage bus and coach hire for weddings and other occasions. Cycles on trains - Northern Rail's policy for our region. Map My Ride - adventurous mountain bike rides in our area. Pennine Bridleway Hebden Bridge ride - 13-mile mountain bike challenge. Hebden Bridge Walkers' Action - community organisation which encourages walking for enjoyment. The website has ideas of where to walk, public transport information, and details of organised group walks in and around Hebden Bridge. Hebden Bridge became Britain's first Walkers Are Welcome town in 2007. Mytholmroyd Walkers' Action - another local community organisation which encourages walking for enjoyment. The website has guides to walks around and about Mytholmroyd, illustrated with excellent photographs. urban75 item on Hebden Bridge Station - urban75 is an online community/e-zine website which has some great photos, including these of Hebden Bridge station. The website also has some good photos of Hebden Bridge itself, the Fox and Goose, and of the walk from Hebden Bridge to Haworth over the moors. 1972 film - features Lloyd Greenwood and Granville Canty helping passengers arriving at the station before the platforms were raised. 1981 Nov 14 Juliet Bravo - features Hebden Bridge station with an ancient diesel multiple unit in blue at about 1 min 24 sec from the start. Other places making an appearance are (10min30s)Black Pit Aqueduct, (22min40s)St. George's Square, Crown Street, Royd Terrace, the Old Bridge, the White Swan, (26min 50s) a graveyard probably at Slack, (31min) St George's Bridge, Shoulder of Mutton, Widdop Reservoir, and (35min45s) a mill. 2002 Enabling Theatre - Enabling Theatre won a national award in 2002 and were invited to collect it from the Houses of Parliament. Find out what happened when they tried to travel to London.